If a team registers a total in excess of 500 in the very first innings of a Test match, they are often considered the favourites to win the match. However, things may not always be all that easy if the opposition team is determined to give a tough fight and possibly turn the tables. Most recently, the 1st Test of a 3-match series between Pakistan and West Indies saw the former score 579 for 3 in the first innings. The West Indians fell short of the Pakistani score by 227 runs but blew the hosts away for 123 in the 3rd innings. Chasing 346 to win, they gave Pakistan a scare before folding up for 289 and losing by 56 runs. England 1st innings score – 551 for 6 dec. 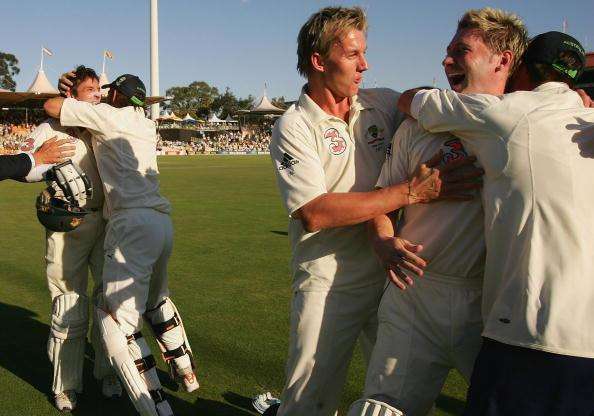 This was the follow-up series to the iconic 2005 Ashes series where England had scripted an unforgettable 2-1 win against the odds. The Australians were clearly out for revenge and started off the series with a majestic 277-run victory in the first Test at Brisbane. In the second Test at Adelaide, though, the momentum looked to be tilting back in England’s favour as they batted first and rode a double century from Paul Collingwood to register a massive total of 551 for 6 in their first innings. However, the hosts were up for the challenge and managed to notch up 513 runs, courtesy of centuries from Ricky Ponting and Michael Clarke. This was followed by an inspired bowling performance, led by Shane Warne’s 4 for 49, which helped dismiss the English for just 129. With just 168 runs to chase in the 4th innings, the Aussies went about their business at a brisk pace and finished the game in 32.5 overs with 6 wickets still intact.